Charlemagne's expansion of the Frankish empire around 800, including northern Italy and Rome, brought on a brief period of stability and unity in Francia. This created opportunities for Jewish merchants to settle again north of the Alps. Charlemagne granted the Jews freedoms similar to those once enjoyed under the Roman Empire. 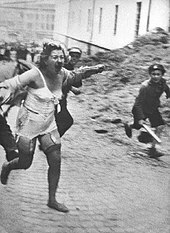 In addition, Jews from southern Italy, fleeing religious persecution, began to move into central Europe. Returning to Frankish lands, many Jewish merchants took up occupations in finance and commerce, including money lending, or usury. (Church legislation banned Christians from lending money in exchange for interest.) From Charlemagne's time to the present, Jewish life in northern Europe is well documented. By the 11th century, when Rashi of Troyes wrote his commentaries, Jews in what came to be known as "Ashkenaz" were known for their halakhic learning, and Talmudic studies. They were criticized by Sephardim and other Jewish scholars in Islamic lands for their lack of expertise in Jewish jurisprudence and general ignorance of Hebrew linguistics and literature. 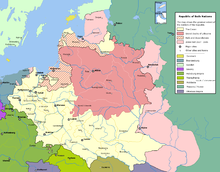 [dubious – discuss] Yiddish emerged as a result of Judeo-Latin language contact with various High German vernaculars in the medieval period. It is a Germanic language written in Hebrew letters, and heavily influenced by Hebrew and Aramaic, with some elements of Romance and later Slavic languages. ^ a b "First genetic mutation for colorectal cancer identified in Ashkenazi Jews". The Gazette. Johns Hopkins University. 8 September 1997. Retrieved 24 July 2013. ^ Feldman, Gabriel E. (May 2001). "Do Ashkenazi Jews have a Higher than expected Cancer Burden? Implications for cancer control prioritization efforts". Israel Medical Association Journal. 3 (5): 341–46. Retrieved 4 September 2013. ^ a b c d "Reconstruction of Patrilineages and Matrilineages of Samaritans and Other Israeli Populations From Y-Chromosome and Mitochondrial DNA Sequence Variation" (PDF). Archived from the original (PDF) on 8 May 2013. Retrieved 15 August 2013. ^ a b c "Jews Are the Genetic Brothers of Palestinians, Syrians, and Lebanese". Science Daily. 9 May 2000. Retrieved 19 July 2013. ^ Wade, Nicholas (9 June 2010). "Studies Show Jews' Genetic Similarity". The New York Times. Retrieved 15 August 2013. ^ "High-resolution Y chromosome haplotypes of Israeli and Palestinian Arabs reveal geographic substructure and substantial overlap with haplotypes of Jews" (PDF). Retrieved 15 August 2013. ^ a b Sergio DellaPergola (2008). ""Sephardic and Oriental" Jews in Israel and Countries: Migration, Social Change, and Identification". In Peter Y. Medding (ed.). Sephardic Jewry and Mizrahi Jews. X11. Oxford University Press. pp. 3–42. ISBN 978-0199712502. Della Pergola does not analyze or mention the Ashkenazi statistics, but the figure is implied by his rough estimate that in 2000, Oriental and Sephardi Jews constituted 26% of the population of world Jewry. ^ Cecil Roth (1966). Cecil Roth; I. H. Levine (eds.). The World History of the Jewish People: The Dark Ages, Jews in Christian Europe, 711–1096. 11. Jewish historical publications. pp. 302–03. Was the great Eastern European Jewry of the 19th century preponderantly descended (as is normally believed) from immigrants from the Germanic lands further west who arrived as refugees in the later Middle Ages, bearing with them their culture? 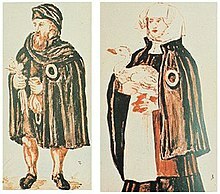 Or did these new immigrants find already on their arrival a numerically strong Jewish life, on whom they were able to impose their superior culture, including even their tongue (a phenomenon not unknown at other times and places – as for example in the 16th century, after the arrival of the highly cultured Spanish exiles in the Turkish Empire)?) Does the line of descent of Ashkenazi Jewry of today go back to a quasi-autochthonous Jewry already established in these lands, perhaps even earlier than the time of the earliest Franco-German settlement in the Dark Ages? This is one of the mysteries of Jewish history, which will probably never been solved. ^ Wesselius, J.W. (2002). Camp, Claudia V.; Mein, Andrew (eds.). The Origin of the History of Israel. p. 99. ISBN 978-0567564252. Retrieved 1 March 2019. ^ Khazzoom, Loolwa. "Jews of the Middle East". Jewish Virtual Library. Retrieved 4 September 2013. ^ Greenberg, Richard; Cohen, Debra Nussbaum (Fall 2005). "Uncovering the Un-Movement" (PDF). B'nai B'rith Magazine. Archived from the original (PDF) on 23 September 2005. Retrieved 5 September 2013. ^ "Tallit: Jewish Prayer Shawl". Religionfacts.com. Retrieved 24 July 2013. ^ "Top 100 Players October 2013 FIDE Top players archive". Ratings.fide.com. Retrieved 31 October 2013. ^ Nelly Lalany (23 July 2011). "Ashkenazi Jews rank smartest in world". Ynetnews. Retrieved 27 October 2013. ^ Tony Nick Frudakis (19 July 2010). Molecular Photofitting: Predicting Ancestry and Phenotype Using DNA. p. 383. ISBN 978-0080551371. ^ Jesse Green (6 November 2011). "What Do a Bunch of Old Jews Know About Living Forever?". New York Magazine. Retrieved 19 July 2013. ^ Martin Gershowitz (16 October 2013). "New Study Finds Most Ashkenazi Jews Genetically Linked to Europe". Jewish Voice. Retrieved 31 October 2013. ^ Kaplan, Karen (9 September 2014). "DNA ties Ashkenazi Jews to group of just 330 people from Middle Ages". Los Angeles Times. ISSN 0458-3035. Retrieved 21 August 2017. ^ "How to Interpret Patterns of Genetic Variation? Admixture, Divergence, Inbreeding, Cousin Marriage". Anthropogenesis. 24 July 2012. Retrieved 19 July 2013. ^ Behar, Doron M.; Yunusbayev, Bayazit; Metspalu, Mait; Metspalu, Ene; Rosset, Saharon; Parik, Jüri; Rootsi, Siiri; Chaubey, Gyaneshwer; Kutuev, Ildus; Yudkovsky, Guennady; Khusnutdinova, Elza K.; Balanovsky, Oleg; Semino, Ornella; Pereira, Luisa; Comas, David; Gurwitz, David; Bonne-Tamir, Batsheva; Parfitt, Tudor; Hammer, Michael F.; Skorecki, Karl; Villems, Richard (8 July 2010). "The genome-wide structure of the Jewish people" (PDF). Nature. 466 (7303): 238–42. Bibcode:2010Natur.466..238B. doi:10.1038/nature09103. PMID 20531471. Retrieved 4 September 2013. ^ "Gene study settles debate over origin of European Jews". AFP. 16 January 2013. Archived from the original on 1 June 2013. Retrieved 4 September 2013.